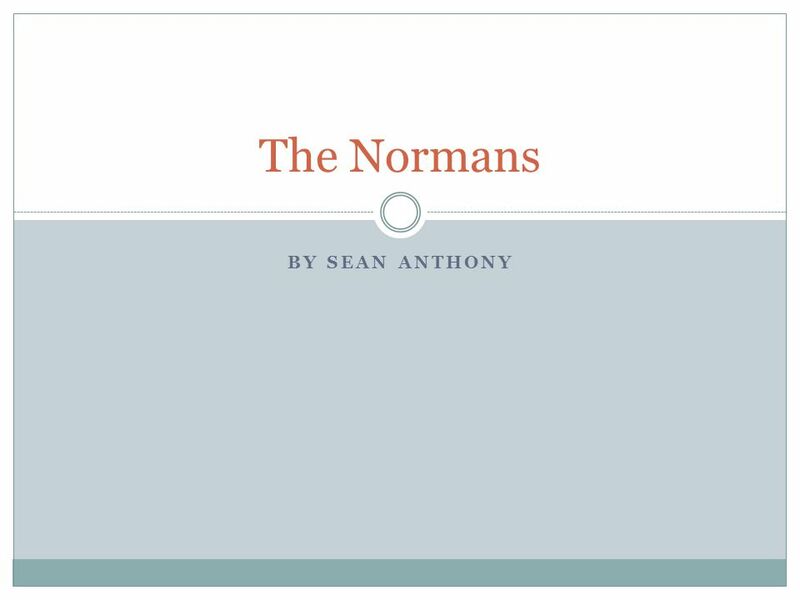 BY SEAN ANTHONY The Normans. Who were the Normans? The Normans were originally Vikings from Scandinavia At the beginning of the tenth century the French. 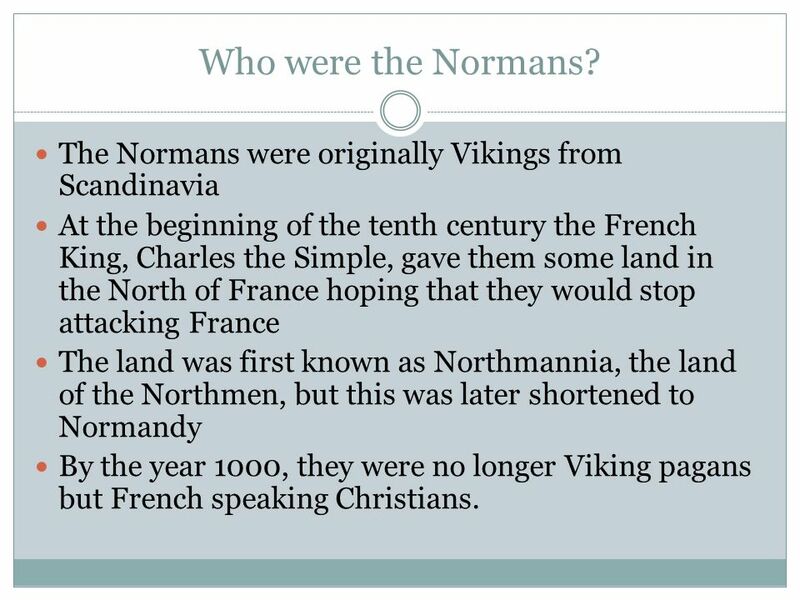 2 Who were the Normans? The Normans were originally Vikings from Scandinavia At the beginning of the tenth century the French King, Charles the Simple, gave them some land in the North of France hoping that they would stop attacking France The land was first known as Northmannia, the land of the Northmen, but this was later shortened to Normandy By the year 1000, they were no longer Viking pagans but French speaking Christians. 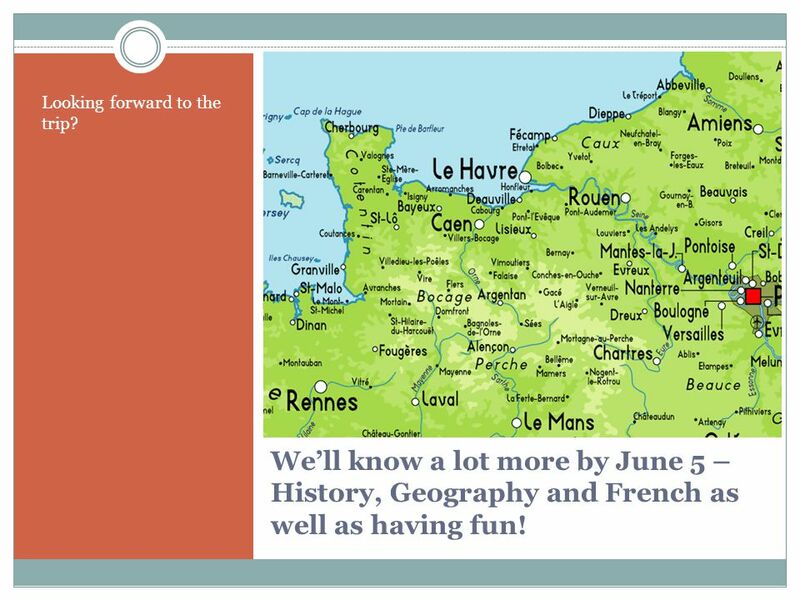 6 We’ll know a lot more by June 5 – History, Geography and French as well as having fun! Looking forward to the trip? 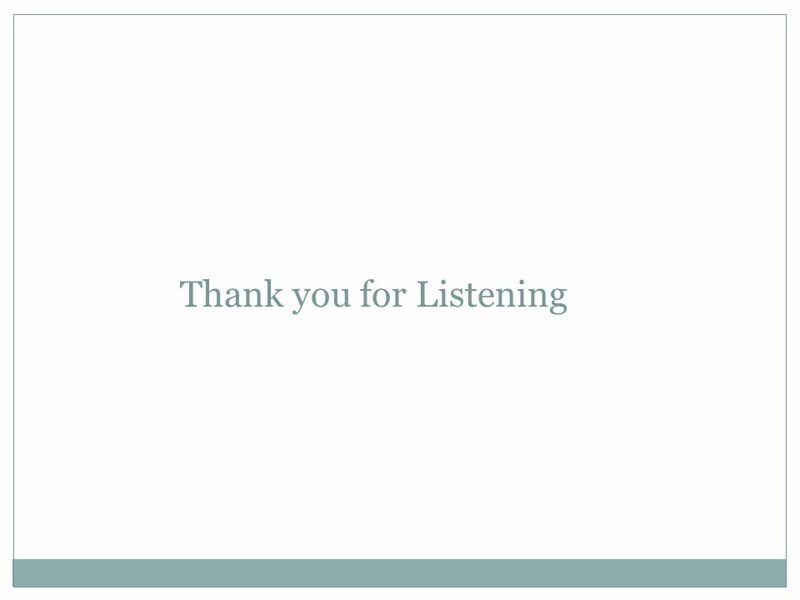 Download ppt "BY SEAN ANTHONY The Normans. Who were the Normans? The Normans were originally Vikings from Scandinavia At the beginning of the tenth century the French." By Lucy Clarke. On January 5 th, 1066 the tragic death of Edward the Confessor happened. From this death there needed to be a new King. The Stormin’ Normans INB p. 126 Copy only the text that appears in red. INB p. 126 Copy only the text that appears in red.   The Romans  Julius Caesar invades Britannia BC  The Saxons  Departure of Romans in A.D. 410  Saxons, Angles, and Jutes  Britain became. The Vikings AD. “In this year Beothric [King of Wessex] took to wife Edburgh, daughter of King Offa. And in his days came first three ships of. 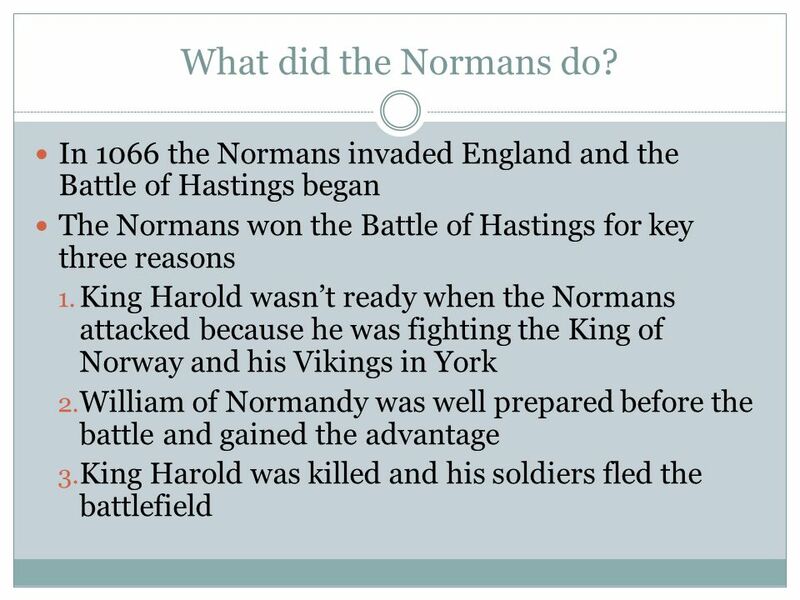 The Battle of Hastings THE NORMAN INVASION OF ENGLAND. Norman Conquest Reti Vainokivi, Johanna Urm, Getter Õigus, Andra Prems. Broadwater School History Department 1 Glossary King Edward the Confessordied in December 1065, without a son to become King. King Harold Godwinsonchosen. 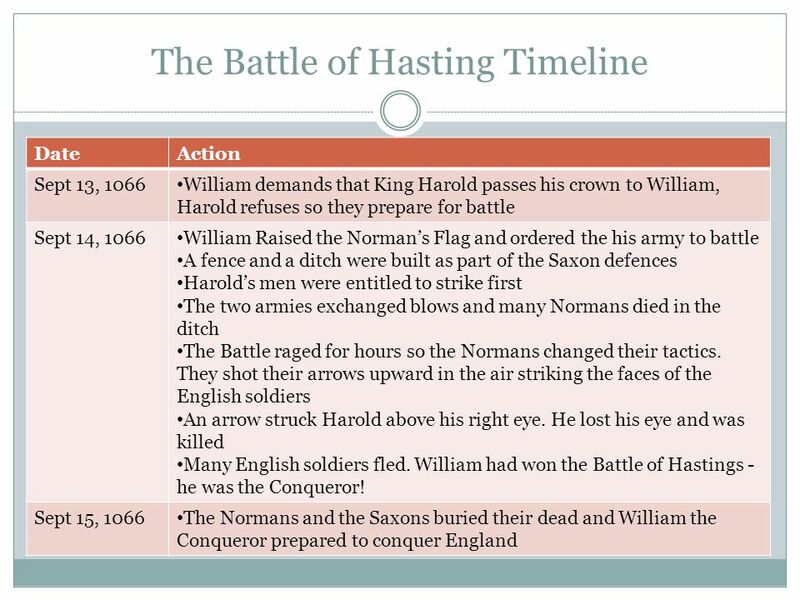 1 © HarperCollins Publishers 2010 Cause and Consequence Why did William win the Battle of Hastings? CHRONOLOGY COUNTS WE KNOW MORE THAN WE THINK Ann Moore, SHP Fellow. 1066 and the Bayeux Tapestry Ashleigh and Heidi. 1. Edward the Confessor was the King of England.In January 1066, Edward died. He did not have any children. Did Ya Know… England was ruled by “French” kings for 387 years? – “French” = Norman How did THAT happen? 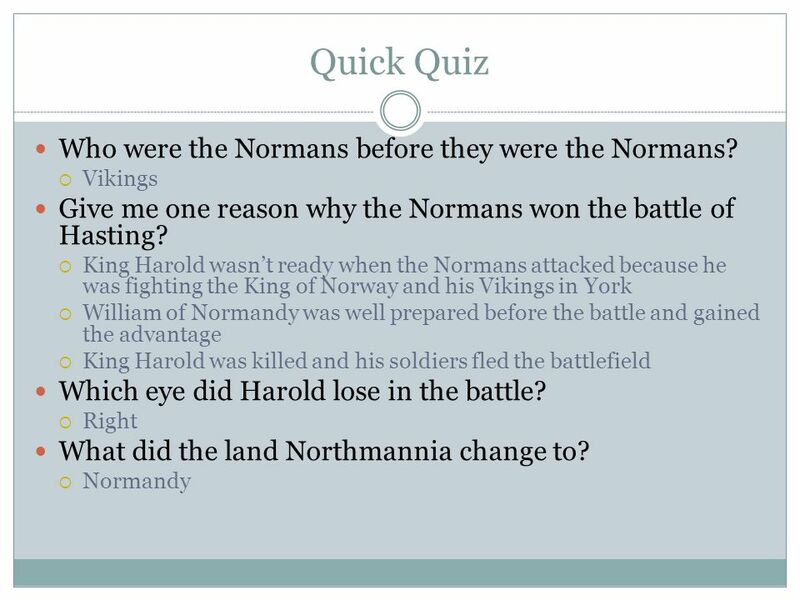 NATIONAL CURRICULUM KEY STAGE 3 HISTORY THE NORMAN INVASION AND CONQUEST INTERACTIVE How did the Norman Invasion and Conquest change England? The battle was between King Harold the 2 nd of England and Duke William of Normandy. King Harold Duke William. THE NORMANS. At the beginning of the tenth century, the French King, Charles the Simple, had given some land in the North of France to a Viking chief. Telling the tale of Here the body of King Edward is being carried to the church of St Peter the Apostle. King Edward in bed addresses his loyal. 1/28 Focus: 1/28 Focus: – Kings began to gain more power and centralize power during the high middle ages – England was one of the first countries in.